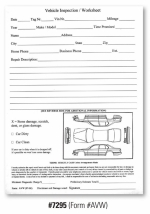 An excellent pre-service write-up form with all the pertinent information and space to report any vehicle damage. Form has the standard disclaimer and minimum diagnostick charge for customer to verify. Form is 1-part in White 20# white stock. Print is in black ink. forms are padded 100 sheets per pad 1 pad per package. In stock for quick shipment.